As well as links to user registered pages. The Skein Web UI is usually accessed through the YARN Resource Manager Web UI. 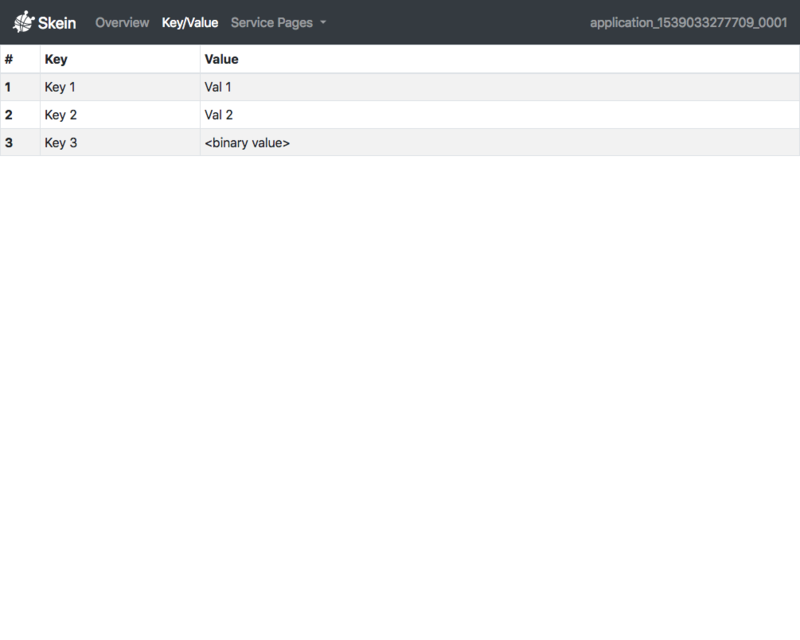 The address can also be obtained programatically through the skein.ui.WebUI object (found at ApplicationClient.ui). In this case, my-first-service has 2 containers running, 1 container succeeded, 1 container killed, and 1 container failed. 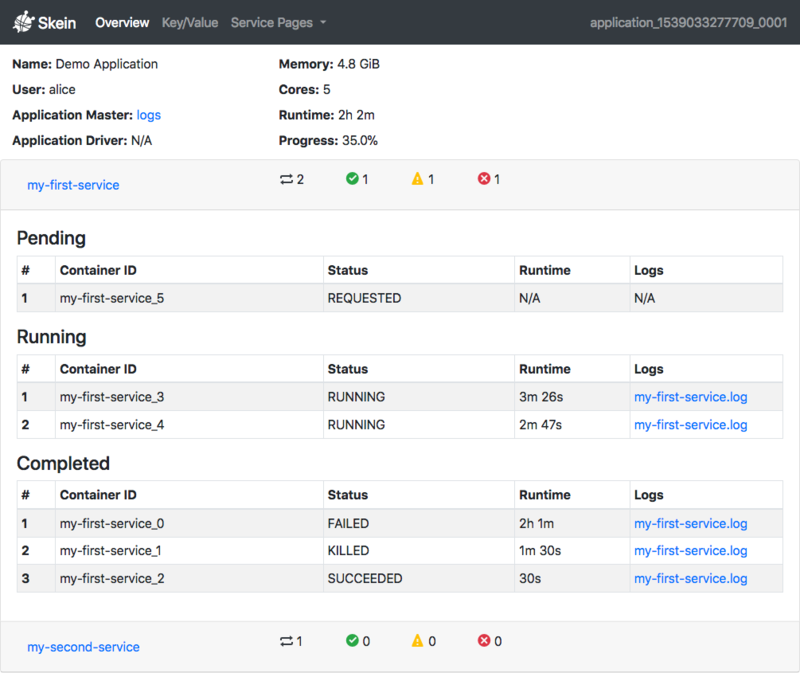 Opening the accordion for the service displays three tables, summarizing all pending, running, and completed containers. If applicable, links to the live logs for each container are provided, as well as their current status and total runtime. The Key/Value page contains information on all key-value pairs currently set in the Key-Value Store. This can be useful for debugging applications. Note that if a value is not UTF-8 encodable it is displayed as <binary value>. 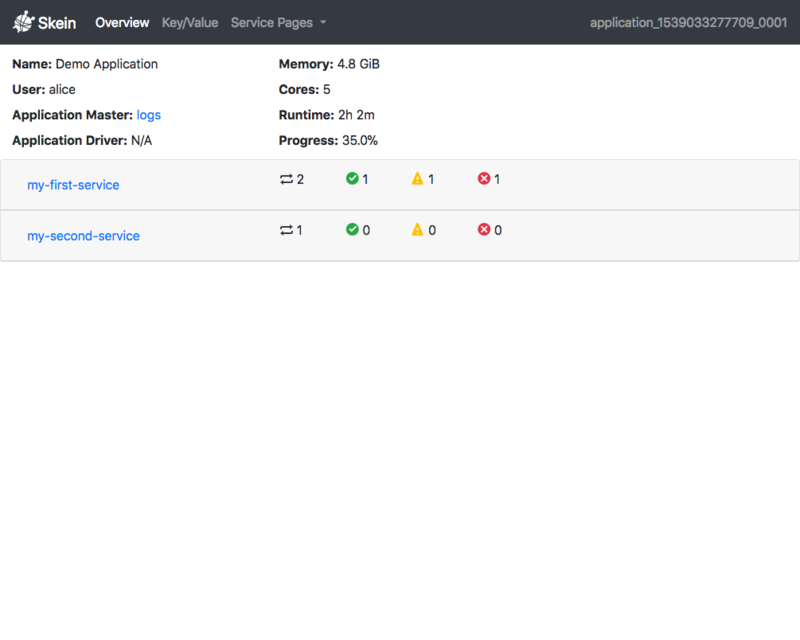 Applications can register additional pages in the Web UI, which are available through the “Service Pages” dropdown. This can be useful for providing application specific dashboards. Custom pages can be added with WebUI.add_page(), removed with WebUI.remove_page(), and queried with WebUI.get_pages(). Add a new proxied page to the Web UI. Remove a proxied page from the Web UI. 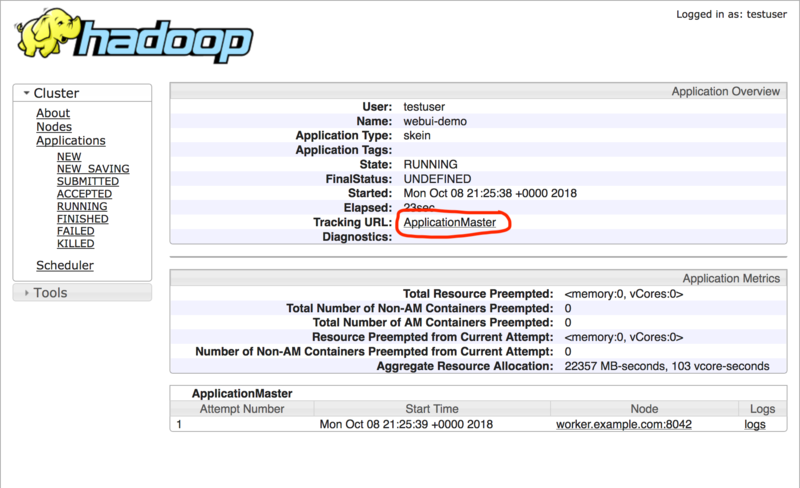 # The link in the dropdown will be "My Custom Page"
Note that due to limitations in the YARN web application proxy, only GET requests can be successfully proxied through in most deployments (support for PUT requests was added in Hadoop 3). This means that modern web components like websockets won’t work, nor will many RESTful web apps. Even so, useful web pages can still be supported. An example dashboard with live updates using bokeh is available here. Since the YARN web application proxy doesn’t support websockets, we use an AjaxDataSource. This is less efficient than a ColumnDataSource (which uses websockets), as it requires polling the server to get updates. For small amounts of data though this is sufficient and fine. We choose a dynamic port, as we can’t know for sure what ports will be available on the deployed container. # Register the page with the Skein Web UI. YARN handles authentication but not authorization for application web pages. As such, users accessing the pages must successfully authenticate with YARN (either using kerberos or “simple” authentication, depending on cluster configuration). However, by default any successfully authenticated user will have access to the Skein Web UI. All requests to the Web UI are authenticated by YARN and authorized by Skein against the specified ACLs. This goes both for requests made from outside the cluster (through the YARN web ui) and inside the cluster with direct access to the Web UI (this is due to YARN’s provided security filter). While the Skein Web UI is secured against both external and internal access by the YARN security filter, Custom Pages are currently only secured against access from outside the cluster (i.e. through the YARN Web UI). Users with SSH access to the cluster and knowledge of the internal address/ports used for custom web pages will currently have unrestricted access to these custom pages. This is fixable, but deemed lower priority, as it’s only an issue in the case of malicious users that already have direct access to the cluster. If this is a problem for you, please let us know by filing an issue. Open an issue in the issue tracker.